I have returned to work. It is a gradual return, beginning with 2 weeks at 4 hours a day, the next 2 weeks will be 8 hours Monday, Wednesday, and Friday and 4 hours Tuesdays and Thursdays. It is a good thing that I have the gift of loving those people who surround me at work, because it has been a challenge being back….bigger than I thought. I have found it difficult to concentrate when others around me are talking (been a long time since I have had to multitask that way), truthfully haven’t felt very successful and like I have let them down in some of my research tasks over the last week or so, and have definitely been more tired (something I haven’t wanted to allow myself to admit at all this last year and a bit…staying positive and focused on being well was too important to me to allow many thoughts of “how is this truly impacting me”?). Don’t get me wrong, truly I did feel pretty great going through my treatment most of the time, but at some point I wonder if I lost a little contact with honestly checking in because I was afraid that if I let others down they wouldn’t want to be around me, or worse letting myself fall down and not be able to get back out of that well. But I digress – that is now in the past, it is today I can address. Getting to the gym and finding the energy I need for my workouts (that in turn return energy and endorphins to me). I have found myself in tears daily this last few weeks. I have wondered iver the past months, since loosing Mom, if antidepressants are something I need to look into, but I am not yet willing to give up on therapy, nutrition and exercise to get me through this timeframe – I will talk to my doctor about them if needed. And anger and frustration have been kicking in over the silliest of things – for example Sunday when walking my boyz Conan would stop to sniff, I would turn to look back and my ear bud kept falling out of my ear. I was becoming a real potty mouth, muttering under my breath…seems a justified reason, right? Ok, not so much. I kept trying 3 deep breaths but clearly wasn’t into it until I made the choice that, no, this was not how I wanted my day to go. I stopped in my tracks, one leash in each hand, put my face to the sun, closed my eyes, and breathed – taking in that warm and loving light from the sun on my face and reflecting on the snow around me, the fresh cool air invigorating my lungs, and the combination soothing my spirit. I am sure if anyone was looking out the windows of their homes they would have been sending the men in white jackets to “help” me, but I didn’t care. This moment wasn’t about appearances or what others would think, it was about me and about what I needed to reconnect to that beautiful loving and supportive spirit within me. And I found that connection, the joy in the present moment, and was able to reset. Yesterday I had my first apppintment with the 3rd psychologist, this one out of the Cancer Centre. He actually runs an ovarian cancer support group for women in Calgary. In our hour together he surprised me by telling me that ovarian cancer survivors rarely go back to work until a year after their last chemo treatment (that would be the end of May for me). He said that often times with cancer patients, while going through chemotherapy there is less of a feeling of vulnerability because you have the protection of the chemo running thriugh your system. Often cancer patients are “better” mentally when enduring treatment because they have a solid and obvious job to do – stay positive and beat the cancer! When treatment is over is when the fear hits for a lot of us. So much of what he said hit home for me. Many “a-ha” moments. He also gave me some tools such as online support groups and recommended the book “Picking Up the Pieces – Moving Forward After Cancer Treatment”. He encouraged me to be lost for awhile, let myself meander and reconnect to my once adventurous spirit. 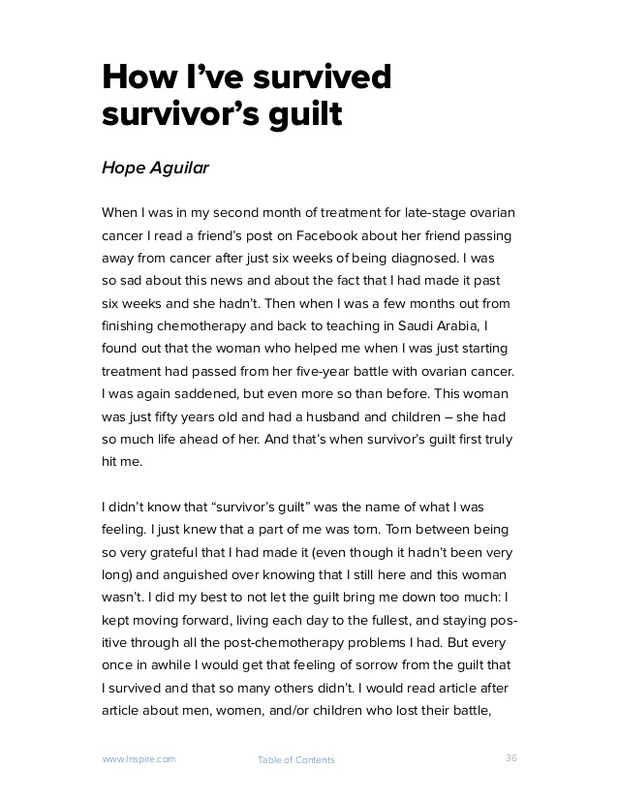 And here is the surprising little shock he gave my system – he told me I had been diagnosed with Ovarian Cancer. Shouldn’t have been a surprise, after all this last year has been all about being treated for ovarian cancer, but that’s just it. I had focused on being treated for it, not that I was diagnosed with it. That feels like a pretty big difference for me today. As I have been dealing with new fears and work my way through some raw emotions, feeling broken, weak and mostly somehow alone in this path, I have not been feeling very inspiring at all….but perhaps here is the inspiration. I continue to reach out and seek the help that I need. I have learned to ask for help. And perhaps I am even learning to be kind and gentle with myself and accept that, yes, it is okay to be lost for a little while. And writing marvelously honest posts like this one will be very centering and therapeutic, too. Great post. Your very greatest ally right now is your willingness to explore and be open to it all. JUST BLOODY COURAGEOUS. And patience – what a virtue. GOD LOVE YOU. I can only emapthize with this next leg of your journey, but it all makes sense to me! One of the Hoffman practices I love the most in challenging times is the Quadrinity Check. Which parts of me need What to be balanced and well? When I am freaking out, my Emotional Child needs something (most often parenting), when I’m angry and critical (I need to pay attention to my Intellect – they made a pact you know! 🙂 ) and always when I am unsettled emotionally, my body pays the price in tension, in soreness, in lack of sleep, etc. Make time to listen to each part of you, and serve yourself first in all the ways. You are inspirational to me in every way. Sending love and light. Be well, sister. Glenna – you are so inspiring! Good luck in Vegas! Your survival is such a gift – even to those of us who have lost loved ones to cancer. As for the reasons? That’s something nobody can say for sure but it doesn’t have to be anything super huge and groundbreaking…..it could be this blog right here. A place where you shine light, humor, and honesty in a place where people that need it and will benefit from it can find. Amazing! I’m so glad you shared your blog with me! Thank you Corinna. I have enjoyed meeting you and hope our paths cross again.